The once dynamic striker was taken to the Milton Cato Memorial Hospital that fateful Sunday where he remained until the next Friday before getting full medical attention. According to Nichols: âMy foot was already smelling up the place and when the doctor come, he say they go have to cut it off.â And so, the young manâs leg was amputated. He has been walking with crutches ever since. Nichols recalls having to spend two carnivals in hospital, a recovery he described as slow. 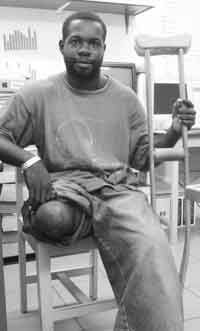 Now, almost ten years later, Nichols will be getting a new lease on life as members of the Police Force are raising funds to fit the young man with a prosthesis. âI will like to thank the police force for attempting to help me,â said Nichols who added that whenever he is fitted, he would be looking for a job. âYou have to put God first,â he said. He said he is glad someone sees he still has a future as he still plays soccer sometimes. During their fund- raising attempts, the Police Force will stage its second annual Christmas Caroling Contest on Wednesday, December 15 beginning at 8 p.m. The event, reported to be a huge success last year, will feature several choirs from the various divisions and branches within the organization along with members of the Auxiliaries, SVG Cadets and Prisons. The Port Police Choir is expected to make its debut at the contest. The event will have guest appearances by the Barrouallie and Calliaqua Police Youth Clubs, Carlton âCPâ Hall, Vivi Soul, Roland Bowman and the Officerâs Choir with music provided by the Police Band. A release from the Police said that the funds raised from the contest, which will be held under the theme, âCaroling for a causeâ, would be used to assist Nichols. Meanwhile, the Barrouallie Police Youth Club will hold its third annual Community Christmas Caroling Contest on December 17, 2004 at 8:00 p.m. at the Barrouallie Playing Field. This contest will be held under the theme, âDown with violence and crime, up with peace and love for this Christmasâ. Eleven choirs will be participating this year.